This is a long slide presentation, but well worth reviewing in its entirety, that looks at the state of the internet globally today, the state of traditional media impacted by online and how social media and mobile companies are performing. The commercial internet is now 20 years old and has 2 billion active users, leaving 2/3 of the world left to go. In the US 'new media' stocks are valued at three times the value of 'old media', however this includes Apple, which significantly outrates all other players. Digital advertising in the US is making huge gains and now accounts for 20% of ad spend. Looking at ad revenue, TV remains slightly ahead of digital (42% to 38%), however over the last six years radio has declined (11% to 7%) and print media has been smashed (20% to 9%). 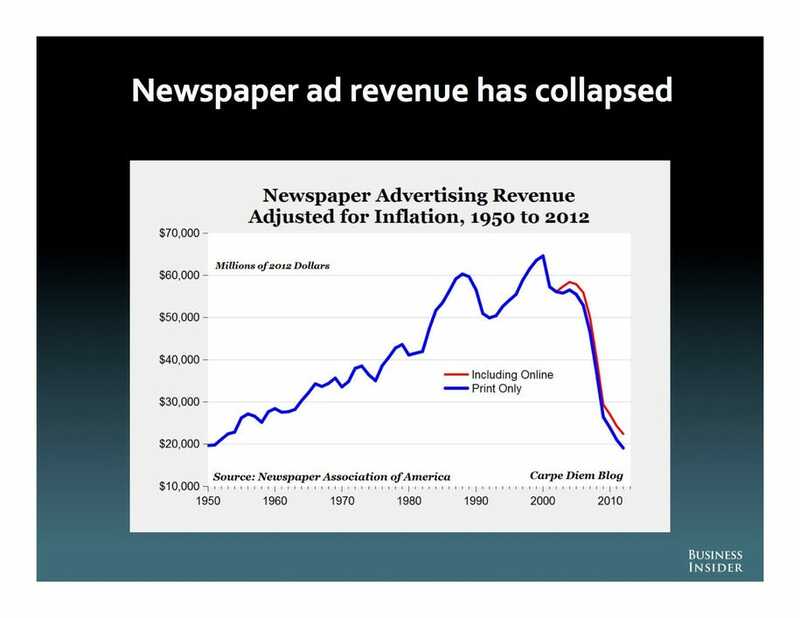 US newspaper ad revenues are in freefall (see chart), with no recovery in sight - and TV shows signs of being next as digital video is growing, with PayTV subscriptions in decline. Online portals are in decline as Google, Facebook and others grow, with US citizens now spending more time on social media than in portal sites. Ecommerce is growing rapidly in total spend and share of retail, with mobile just beginning to be important. Global smartphone phone sales overtook PCs last year and are expected to soon dwarf them, with tablets expected to match PC sales by 2016. China now drives about 25% of smartphone sales. By 2015, about 80% of internet connections are expected to be mobile, up from 55% in 2010 and none in 2005.Mobile internet users are doing everything that desktop users did online, plus more - such as in-store buying decisions - and mobile usage is soaring. However mobile ads are likely to remain a small part of the equation due to small screens and is growing slower than internet or TV advertising did. 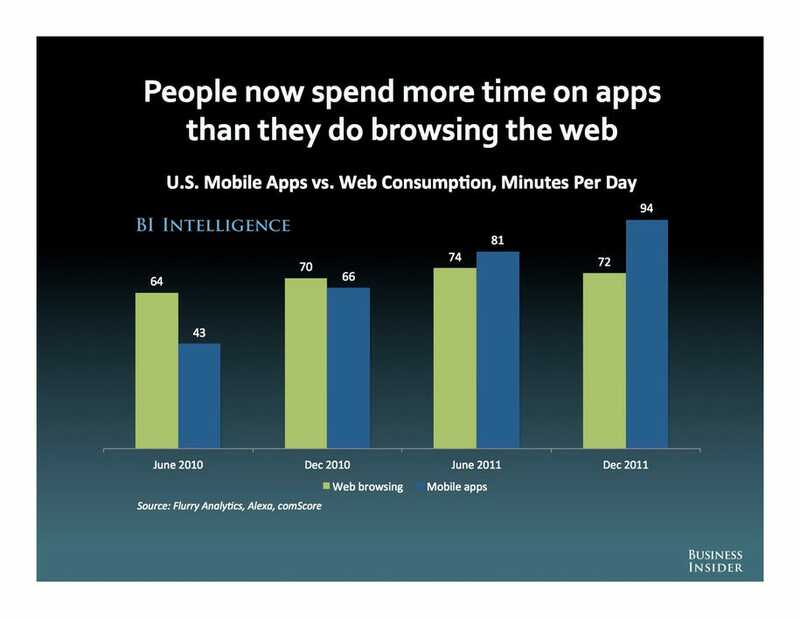 Mobile app purchase and use is also growing fast, with people in the US spending more time spent using mobile apps than browsing the web. However we're not in a new tech bubble - the current rate of growth is sustainable.